Railway trade unions called off their strike yesterday (12) following discussions with President Maithripala Sirisena. The President had assured the striking unions that he would look into their demands and provide a solution. Railway workers launched a lightning strike on Wednesday (8) over unmet demands of a salary hike. Speaking to Ceylon Today a spokesperson for the trade unions said that the Government incurred a loss of over Rs 200 million, due to the strike, which could have been used to pay railway workers and that the burden of paying back that loss would fall on the commuters along with the losses they incurred by being unable to report to work for the last five days. He denied the allegation that the Railway Trade Unions held the country at ransom and stressed that the strike was the last resort to have their grievances considered. He added that a railway worker obtains a minimum basic salary of Rs 34,000 for a 48-hour week alongside long hours of overtime and remuneration for holidays worked. 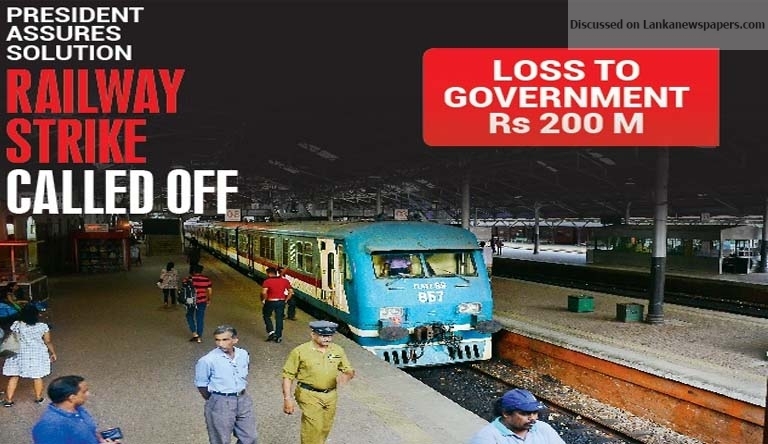 The strike was suddenly launched following the rejection of a Cabinet Paper, on salaries of railway workers, during the weekly Cabinet deliberations. Thousands of commuters were left stranded and struggled to reach their destinations. The sudden strike also resulted in aggrieved commuters taking to the street and occupying the Fort Railway Station on Wednesday (8) evening, which caused damages to the public property including several train carriages. ← WHY TAXES ON SMALLER CARS WERE HIKED?